We will maintain our focus on the XBI as the biotech barometer. Noticing lately the fact XBI is outperforming the IBB & the broader market SPY or SPX, might give us the sense that investors are again, willing to take more risk with the small-mid cap biotech companies after the ~23% drop from the high of 233.73 points on 07/20/2015 to the low of 179.56 points just a month later on 08/24/2015, as they know that the small cap biotech may bounce faster, in the day the reversal pattern confirmed and back to the uptrend. Looking again at the XBI chart, we can see clearly the “indecision” and therefore we see a red day followed by a green day and repeating. The price kept trading around the 200-Day Moving Average for the last trading week. This choppiness frustrating both the bears and the bulls, while the bulls are still looking for the reversal pattern to confirm the return to the uptrend, but we are not there yet. On the other hand, the main positive point I can take from the past trading week, is the confirmation that the bears are no longer in control and they are no more on the upper hand as it was before, during the previous three weeks. Now we are in the midst of choppiness and trading side-way until the war, between the bulls and the bears declare a winner and determine the next direction. There are a few points that we have to watch closely, for the downside, the 214 point is an important point, breaking it down on a large volume will raise a red flag, and would be the sign of the bears return for the next attack after winning the last battle, on the other hand breaking out the 232 points and closing above it on a high volume, would be a positive sign of the bulls winning the battle, by printing a higher high and looking further to reach the 50-Day moving average again. Meanwhile the price can trade side-way for a several days / weeks to create a horizontal channel, only a breakout up or down on a large volume will help us to determine the next move. Keep watching closely and expect the decision to act !! Disclosure: Author is long biotech portfolio. As we know, XBI had 3:1 split so I will update the prices mentioned in this report.... There are a few points that we have to watch closely, for the downside, the 71.34 point is an important point, breaking it down on a large volume will raise a red flag, and would be the sign of the bears return for the next attack after winning the last battle, on the other hand breaking out the 77.19 points and closing above it on a high volume, would be a positive sign of the bulls winning the battle, by printing a higher high and looking further to reach the 50-Day moving average again. 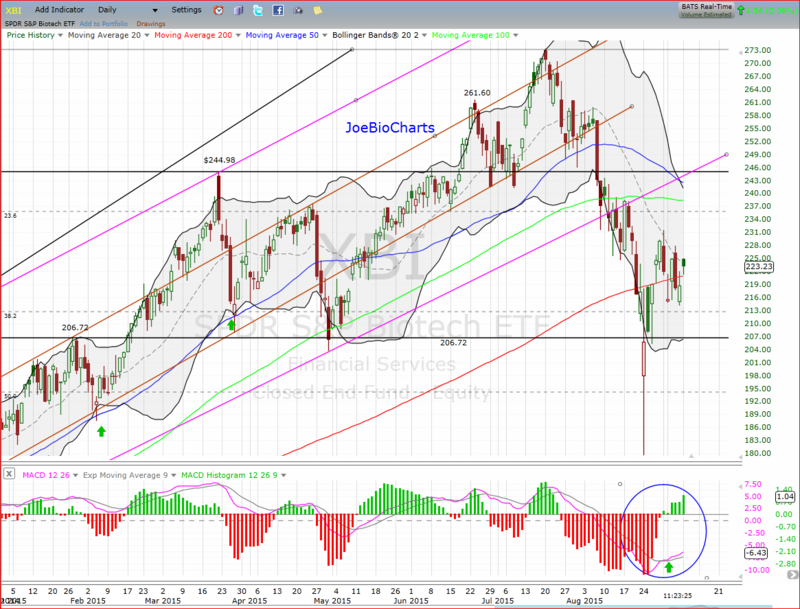 The XBI reaching a higher high & breaking out the 77.19 point, but on a very light volume, so we need a continuation candles with expanding volume to confirm the breakout, looks like everyone around are waiting for the FED interest rate decision this Thursday 09/17 to place their bets!! !